” The grave his subterranean road to bliss. 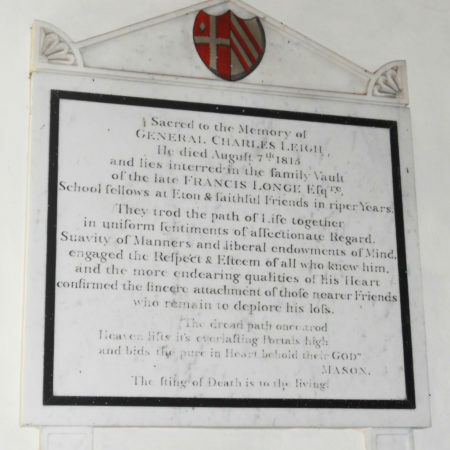 School fellows at Eton & faithful Friends in riper Years. in uniform sentiments of affectionate Regard. engaged the Respect & Esteem of all who knew him. who remain to deplore his loss. The sting of Death is to the living. 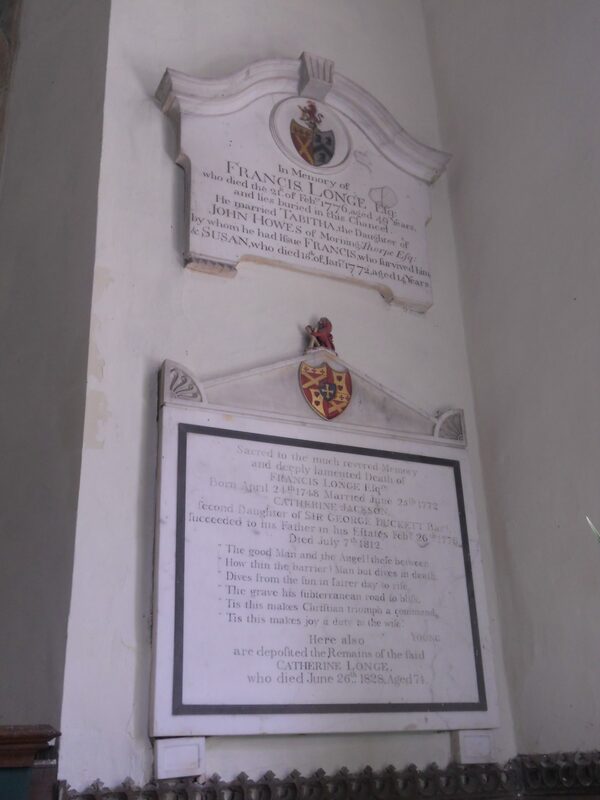 These monuments, in the light of the fact that Francis and Catherine Longe had no children, and that General Leigh (1748-1815) had apparently no family (based on a reading of the monuments in the church), might suggest a contented menage-a-trois in Georgian rural Norfolk, possibly like that shared by the Duke of Wellington and Charles and Harriet Arbuthnot. This may indeed have been the case, but General Leigh’s memorial omits a great deal of family information. While Francis Longe came from a line of local lawyers who had turned into gentry by the acquisition of the Spixworth estate, Leigh’s background was plantocracy. He had a distinguished military career, culminating in his appointment as Governor of the Isle of Wight, and died in Park Street, London. Although his memorial makes no mention of wife or family. at the time of his death he was survived by a widow, a son, and several grandchildren. Leigh’s wife was Frances Byron, daughter of Vice-Admiral the Hon. John Byron (1723-1786) and sister of “Mad Jack” Byron (1756-1791), father of the poet George Gordon Noel, Lord Byron (1788-1824) and of Augusta Leigh, née Byron (1783-1851). Augusta had, in the face of General Leigh’s opposition, married his son George, her first cousin, in 1807. John Byron and his sister were close, and she seems to have been on cordial terms after his death with Byron’s mother. So General Leigh was uncle-by-marriage to both Byron and Augusta Leigh, and Augusta Leigh’s father-in-law. General Leigh’s fears about his son’s marriage turned out to be justified, because his son was a gambler who went through his own money as well as Augusta’s (one of General Leigh’s objections was to her small fortune, although some her friends seem to have objected to the Leigh family, which was not aristocratic). By 1815 Byron had become first famous, with the publication of Childe Harold’s Pilgrimage (1812) and then notorious for his affairs with Lady Caroline Lamb (1812-13) and with other peeresses. Byron had married Annabella Milbanke in January 1815, but the marriage was soon in difficulty and she left him in January 1816. There were rumours that Augusta Leigh’s daughter Medora (born 1814) was Byron’s child, and there have even been some suggestions that Byron’s father , “Mad Jack”, had an incestuous relationship with Frances Leigh. The General would, of course, have been in a position to have known if these speculations had any truth in them. 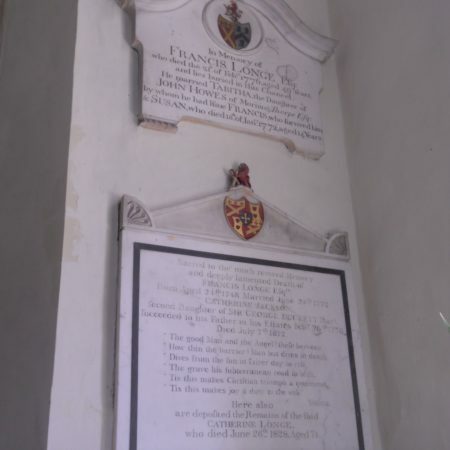 Certainly Mad Jack died in 1791 in Valenciennes in a house belonging to his sister, although she does not seem to have been there at the time. 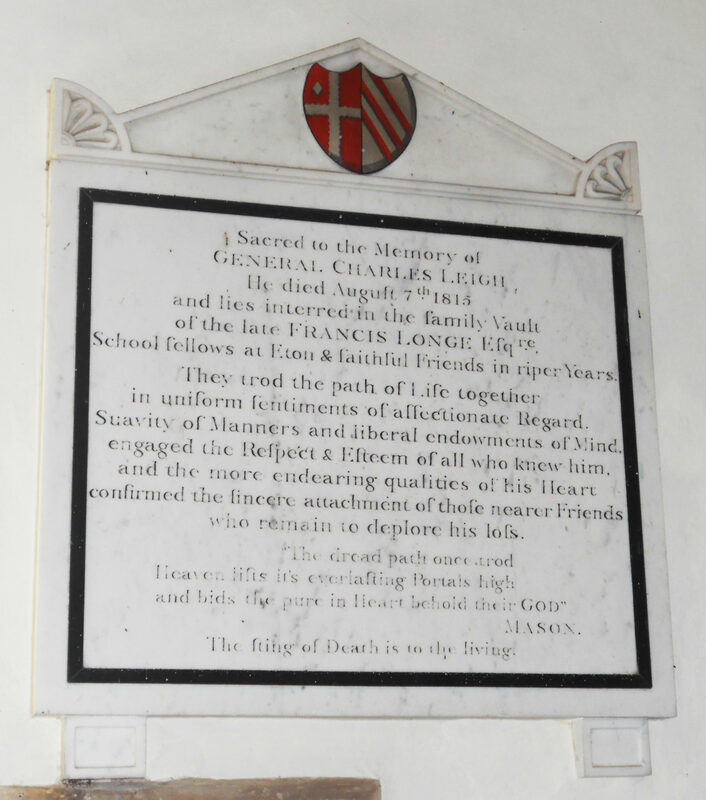 There are therefore several possible reasons for the absence of General Leigh’s family from his memorial. The dispute over George Leigh and Augusta Byron’s marriage may have led to an irreparable family rift, with his wife siding with her son and niece. Lord Byron may by this time have made himself so disreputable that the General had no wish to remind posterity of his connection to the family. 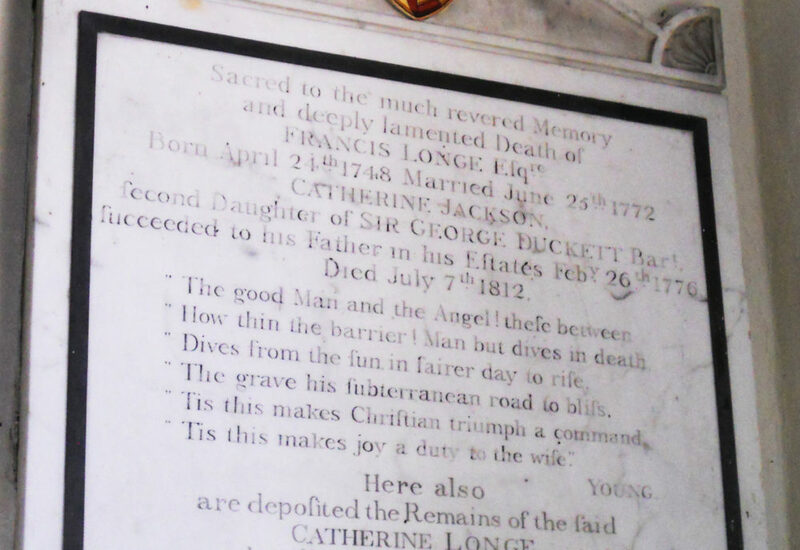 Or Catherine Longe, who survived both her husband and the General, may have been happy to inter the friends together, but felt that the Byron connection was best forgotten.